The Wolverines were a Jeff Rohrkemper boarding penalty away from playing as close to a perfect defensive hockey game as you can possibly play. One night after the CC Tigers destroyed a Boston College team that I think pretty much everyone was afraid to (to the tune of 8 goals), Jon Merrill, Chad Langlais, Greg Pateryn, Shawn Hunwick and company shut down the high-powered CC offense. They gave up only 22 shots in the game, and completely dominated 5 on 5. The penalty killing was spectacular, and were one second away from being perfect against the CC power play. Thankfully that second ticked off and the Tigers' goal with 3:35 to play negated the remainder of Rohrkemper's penalty. Otherwise it would've been a 2-1 hockey game with CC on the power play for another minute and a half, and I would've had a heart attack. After a shift where Michigan was really running around in their own end, Scooter Vaughan got things started 2:23 into the game with a gorgeous inside-out move before roofing one to put Michigan on top 1-0. Seriously, where the hell did he learn to do that? Vaughan was one of the best players on the ice tonight. He's got surprising moves, and one heckuva good shot. If there's a Most Improved Player award, he has to be a shoo-in. The Wolverines went up 2-0 on a 5-on-3 power play. Moffie blasted a shot off a Tiger defender past Howe. That came not too long after the Wolverines killed a long 5-on-3 of their own. Chris Brown killed a dude and Carl Hagelin inexplicably tripped the goalie. Hunwick made a couple of dandies though. After 20 minutes, the Wolverines were outshooting CC 13-7. CC had an early 5-3 shot edge, so Michigan really put the clamps down after the CC 5-on-3. The second period was almost all Michigan. Just a completely dominant performance that resulted in no pucks in the net. We hit at least three pipes, Carl Hagelin just missed on a wrap-around, Rohrkemper fanned on an empty net after a great feed from Moffatt, AJ Treais missed on a breakaway. Howe made some great stops. Michigan did everything but put the puck in the net. Shots in the second stanza were 20-7 in favor of Michigan for a 2-period total of 33-14. Still, CC was one shot from getting right back in the hockey game. The penalty killers were again sharp in the second period. Lynch took his man down after failing to do anything with the puck on a 4-on-2, and after Hunwick made a stop on a failed clear, the Wolverines were great. I wasn't the only one having flashbacks to Buffalo in 2003 when Michigan led the Gophers 2-0, but really should've been up by 4 or 5 goals. The third was back and forth hockey at it's best. We went a good 7-8 minutes at one point without a stoppage. Then the teams started competing to see who could take the worst penalty late in the game. A Tiger checked Hunwick into the board when he came out to play the puck. Then Rohrkemper drilled a guy from behind. That led to about 9 seconds of 4 on 4 and then a long CC power play. They won a faceoff in our end and were able to score on a goalmouth scramble. Thank God that last second ticked off the clock so it counted as a power play goal. Winnett then drew one on the Tigers. As he was sneaking between a CC player and the sideboards, he got drilled. His head was pounded into the glass and the ref was right there. About 45 seconds remained when he came out of the box. After a faceoff with about 30 seconds left, Michigan couldn't get the puck out, but Hunwick rose to the occasion, the defense did a nice job as well and the Wolverines are headed to the Frozen Four for the 24th time in their history! They'll play the winner of North Dakota (6-0 winners over RPI) and Denver (who overcame a late 3rd period deficit to defeat WMU in double overtime by a 3-2 score). Minnesota-Duluth has punched their ticket as well. They'll play the winner of Notre Dame and New Hampshire. Absent from the remaining teams? Miami University. Tee hee. You have to give a shout out to Joe Howe, who made 41 stops in the loss. He was a perfect 20 for 20 in the second period when Michigan could have really broken the game open. For the Wolverines, Jon Merrill was so unbelievably good tonight. Really, the whole defense was. Outside of two bad turnovers by Moffie (he atoned with the GWG!) and one by a player whose number I didn't catch, they were fantastic all night. The penalty killers? Fantastic. I haven't seen an all-around performance like that in a long, long time. With a little puck luck, that game is a blowout. Instead it was a nail-biter, but a dominant performance nonetheless. Louie Caporusso back-checked like a mad-man. He's been positively Kolarikian in his transformation into a player that can impact the game at either end. Hagelin, Rust, Brown....you could go on and on. The silly penalties were there, but the penalty killers bailed their guys out for the most part. Shawn Hunwick wasn't busy (21 stops) but he was big when they needed him to be. Think about this. If Steve Jakiel doesn't leave school, Hunwick is probably playing for Adrian College right now. Instead, he's backstopped Michigan to the Frozen Four and is one quick whistle from having done it in back-to-back years. How big of a moment in retrospect was it that our third goalie decided to take off for Curry College, when he was stuck behind Sauer and Hogan on the depth chart? Have a bad goalie's decision and another man's groin troubles ever meant so much? The seniors started their careers at the XCel Energy Center with an overtime win over Boston College. They will end their careers at the XCel Energy Center, either in heartache or by bringing home #10. Also, a sweep of the WCHA is in play, which would go down as the greatest thing that has ever happened ever. After a very subpar performance against Western Michigan the night before, Michigan was at least able to get back a little bit of momentum heading into the NCAA Tournament by knocking off Notre Dame 4-2 in the CCHA Consolation Game. Notre Dame took a 1-0 lead on a fluky goal. Shawn Hunwick cleared the puck around the boards, but it struck the official and bounced right back into the slot where Riley Sheahan was able to put it in. Michigan then came back with a pair of goals 15 seconds apart. Caporusso came in on a two-on-one and opted to shoot, beating Summerhays to tie the game. Hagelin then put a shot through from around the faceoff dot to make it 2-1 Michigan. The Wolverines extended their lead in the third period. Mac Bennett let a shot go from the point that deflected off a defenseman. Summerhays lunged to cover it, but Jeff Rohrkemper just beat him to it and got enough of the puck to knock it over the goal line. Notre Dame crawled back within one with about 1:20 left in regulation as TJ Tynan was able to bang home a rebound. The Wolverines appeared to seal the game when Scooter Vaughan had a breakaway on an empty net from center ice in. He ended up scoring but the whistle had gone several seconds earlier. The referee ruled a hand pass and blew the play dead. Upon review, there were a couple of things wrong with that call. First, Vaughan touched the puck while it was still in the Michigan zone and hand passes are legal in your own end. 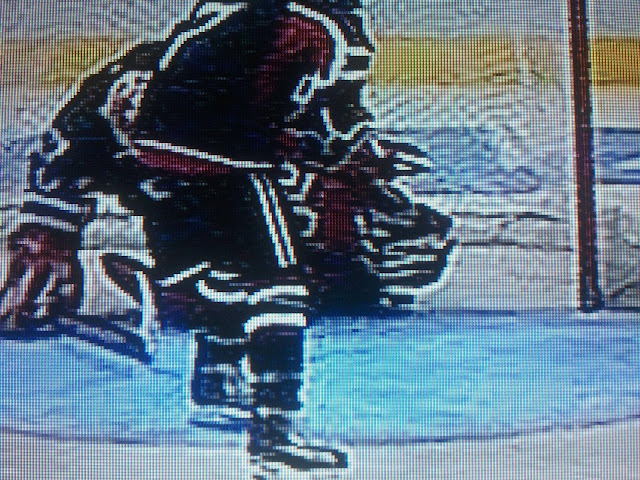 Second, Vaughan was the player who played the puck with his glove in the first place. It was as bad of a call as you'll ever see. It gave Notre Dame a chance to tie the game back up. Fortunately Luke Glendening was able to put one into the empty net that did count, and Michigan escaped with a 4-2 win. The hero of the game was Shawn Hunwick, who made a regulation career-high 42 saves in the victory. Michigan was outshot by a 44-23 margin, including 16-6 in the final frame. Hunwick made a slew of top-notch saves, but none was better than a glove stop he made on Calle Ridderwall in the third period, which prompted me to make a "Call him Kevin Quick, because he just robbed a Swede" joke. The media continued with the trend of not making him the #1 star when he was at his best. Caporusso got the nod, which, okay. He did have a goal and an assist in the 15-second span that gave us the lead, but Hunwick was fantastic once again. The seniors end their careers 16-4-0 at Joe Louis Arena. Caporusso had 13-7--20 in those games. So now it's off to the NCAA Tournament. USCHO has Michigan projected to be the #2 seed in the St. Louis regional, facing Nebraska-Omaha in the first round. If we advance, we would play the winner of Boston College and Colorado College. Adam Wodon from CHN has Michigan the #2 seed in the Manchester, NH regional. He also has us facing UNO in the first round, but he would have us playing the winner of Miami/UNH if we advance. UNH is hosting yet again. As a reminder, we were 1-1-0 against UNO this season. Both games were at Yost. We lost the opening game of the series 4-2 before throttling them 6-1 Saturday night. The Mavericks have struggled down the stretch, going 3-5-0 in their last 8 and 1-4-0 in their last 5. They've been very inconsistent since early December, sweeping only 2 series the remainder of the year (St. Cloud and Wiscy, both at home). The selection show airs at 11:30 EDT on ESPN2.